In the wake of dog deaths at PetSmart locations, an expert says these tips will help owners ensure the safety of their pets when taking them to be groomed. The allegations of mistreatment by PetSmart following the deaths of at least four dogs at routine grooming appointments have served as a wake-up call for pet owners. The incidents that occurred in a five-month span, which PetSmart says are separate and unrelated, emphasize the importance of pet owners doing their homework on the personnel and facilities they are entrusting to groom their beloved animals, an expert told TODAY. Vivian Nash has been in the dog grooming business for almost 40 years and is the owner of Nash Academy in Lexington, Kentucky, which offers a combination of online courses and supervised, hands-on training for aspiring dog groomers. She is also a co-founder of the International Judges Association for Dog Grooming Competitions. "It's an age-old issue, and it's because of a lack of education and no licensing,'' Nash told TODAY about pet deaths during grooming in general. 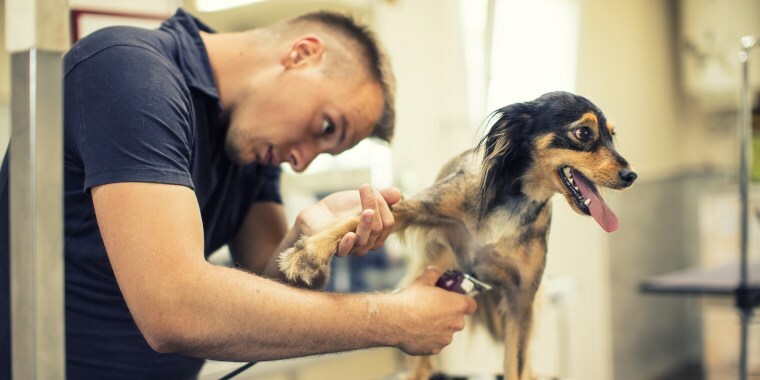 Animal groomers are currently not required to have a license to practice in any state. "This means that you can go out, buy clippers, buy a grooming book, open a salon and call yourself a professional,'' she said. PetSmart maintains that it has the highest grooming safety standards in the industry. Its stylists complete more than 800 hours of hands-on instruction and safety certification while working with 200 dogs of different breeds and sizes, and each salon associate must be safety certified annually, according to the company's website. In dealing with such an unregulated industry, Nash outlined steps that pet owners can take to help ensure the safety of their animal when taking it to the groomer. 1. Check the groomer's credentials. You should look for a certificate, find out the type of training groomers have had and see how long they have been in the profession, Nash advised. "What's true of a lot of salons is that they have a huge turnover rate,'' she said. "It's very hard to find good groomers." Nash also notes to ask if your groomer stays up with the latest information and methods by going to industry shows and other professional development events. Owners should also make sure the facility looks and smells clean, and check that groomers know CPR for cats and dogs in case they have to resuscitate an animal. 2. Stay and watch the grooming process. Most facilities have an observation window or area where owners can watch the groomer at work — which Nash encourages pet owners to do if they don't have to rush out after dropping off their pet. "You should always be able to see your pet because you can watch the handling,'' Nash said. "I teach my staff and the students, you should never have to prepare for a visit (by a pet owner). If you keep a window, it creates a much safer environment for the pet and professional groomer." Owners should also check to make sure the groomer is always close to the dog. Since the animals are usually attached to grooming tables by leashes or nooses, if a groomer steps away and isn't paying attention, the animal could potentially break its neck or hang itself by the noose by jumping off the grooming area. It's also recommended that owners bring their dogs to the facility before they make an appointment so they can acclimate the animal to the environment. 3. See what kind of dryer and equipment the groomer uses. Most dogs enjoy being bathed, so it's the drying part that usually causes the most issues. The horror stories Nash has heard over the years often involve either faulty equipment or groomers who aren't properly educated in using it. Dogs may react differently to a force dryer or a kennel drying unit that features a heating element to dry off the animal after it's been bathed. The dryers, which are used because they're faster than towel trying, are safe if used correctly, but can be extremely dangerous otherwise. "If someone tries to put a towel over the kennel dryer to dry faster, it will smother the dog, or if there's a drying unit where the heating element hasn't been properly cooled down in between uses, it could catch on fire like a blowtorch,'' Nash said. It's not just the heat of the dryer that could be an issue for some pets. "It's the force and the sound of the high-velocity dryers sometimes,'' Nash said. "If the dog reacts to it, they can go into a seizure or heart attack." Items like "happy hoodies" that go over the dogs' ears to blunt the sound and other natural remedies are possible solutions. Another option is just putting the dog on a grooming table and using a small hand dryer. 4. Communicate clearly with the groomer. Some dogs with pushed-in faces, like boxers and pugs, might never acclimate to the force dryers because of natural breathing issues, which need to be clearly discussed with the groomer. "That force of air can take their breath away, and when they experience it, they never forget it,'' Nash said. Owners also need to inform groomers of any medical issues the animal may have. Danielle DiNapoli, an owner of an English bulldog named Scruffles, told TODAY's Kristen Dahlgren that she warned the groomers at a PetSmart in Flemington, New Jersey, not to dry the bulldog because she gets anxious. She received a call less than an hour later that Scruffles had died. PetSmart said in a statement to TODAY that its associates followed rigorous practices and pointed out that an animal autopsy being withheld by the DiNapolis' pending litigation may show pre-existing conditions. Groomers also need to be honest with clients. "If a dog acted up, the groomer needs to tell the client that,'' Nash said. "It's almost like when you babysit and you don't want to tell the parents that their kids were not behaving because you don't want to upset them, but it's important for groomers to be honest about that." It all goes back to groomers being properly educated, but owners still need to make sure they are doing their part to ensure their pets' safety, too. "It's a huge responsibility,'' Nash said. "It's the most important job since we take care of man's best friend."